Denmark #214 used in Faroes [1930 15 øre Christian X 60th Birthday] (F-VF) on 27 November 1930 cover from THORSHAVN (Daka cancel #01.06; the rounded 3 type) to Eide. 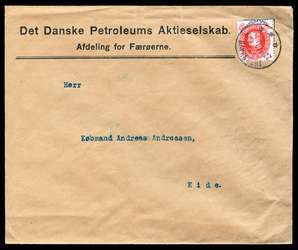 From the Faroe office of Det Danske Petroleums Aktieselskab (The Danish Petroleum Corporation). Very neat and attractive. This stamp issue had a rather short period of use in Denmark and especially in the Faroes.